With Christmas literally only days away, our minds have been racing with menu ideas for our beloved family gatherings. We have compiled three of our most favorite (and easy to make) holiday themed treats for you to try! Combine the sugar, red wine, water, lemon zest and lemon juice in a non-aluminum 4-quart saucepan. Bring the mixture to a simmer over medium high heat and cook until the sugar dissolves. Remove from the heat and set aside. Peel the pears, leaving the stem intact. Using a melon baller, scoop out the core of the pear from the bottom. Place the pears in the poaching liquid and return them to the heat. Bring the pears to a gentle boil, then reduce the heat to a simmer. Poach the pears until tender, about 30 minutes. A toothpick should easily slide through the pear. When the pears are fully poached, cool them to room temperature. Pour the pears and poaching liquid into a clean container, cover, and refrigerate until ready to serve. Place a pear on a dessert plate. Spoon warm chocolate sauce over the pear. Serve immediately! Soak de gelatin for 5 min. in cold water until soft. Beat the egg yolks with the brown sugar. Bring the coconut milk to a boil. Mix a few tbs of the hot coconutmilk into egg yolk mixture, then pour in the rest of the hot coconut milk.. Take your pan away form the stove top and add the gelatin sheets (squeeze the water out!). Stir until completely smooth. Whip the cream and add gently to the mixture. Let the mixture cool down in the fridge for about 3 hours. Preheat you oven (200° C/390 °F). Brush the filo sheets with some butter and sprinkle with sugar. Cut them into small rectangulars (5cm x 8cm) and bake during +_ 10 min. Put a layer of the creamy mixture on a filo sheet. Make small towers. Dress up with some icing sugar and blueberries. In a large bowl, place the chopped white chocolate and set aside. Add the egg yolks and sugar to a small bowl and whisk until pale in color. In a saucepan, over low heat, bring 1/4 (60 ml) cup of the cream to a simmer, and slowly add the cream into the yolk and sugar mixture to temper. Mix the hot mixture with the chopped chocolate. Stir until completely smooth. In another bowl, whip remaining 1 cup (240 ml) of the cream to almost stiff peaks. 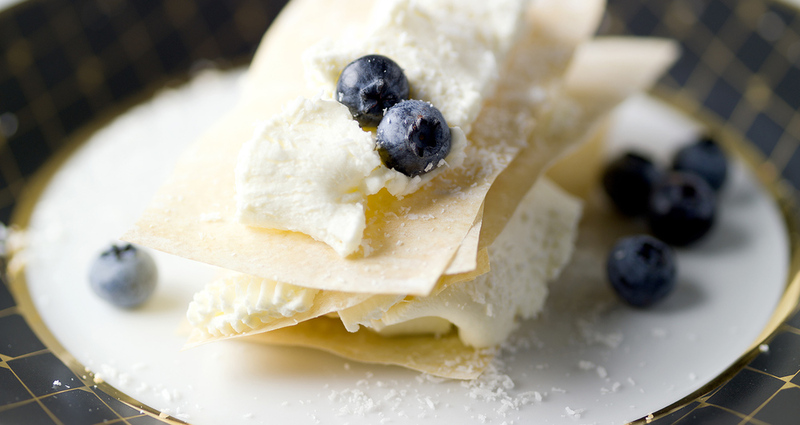 Fold half the whipped cream into the white chocolate mix to lighten and then fold in the remaining whipped cream. Spoon the white chocolate mousse into 4 serving cups and refrigerate until set, approximately 1 hour. Garnish each serving with 3 blackberries and a sprig of mint, if using. Enjoy and let us know how it went!